Successful businessman and founder of McDonald’s Ray Croc once said, “The two most important requirements for success are: first, being in the right place at the right time, and second, doing something about it.” Although it’s unlikely that his words were heard half a world away, it’s the path Japanese-based Koyo Electronics has followed for 60 years. During the 1950s, as Japan struggled to emerge from World War II, Ikeda Yoshilchiro used his personal funds to establish a small company called Koyo Electric to manufacture and sell portable radios. At the time of its founding, Koyo employed six people. A mere two years later, Koyo and another start-up company (now known as SONY) were the leaders in the industry producing portable radios for a post-war market. Looking to further capitalize on consumer interest in portable radios and record players, Koyo Electric changed its name to Koyo Electronics Industries in 1959 and sent representatives to the United States to conduct market research. Their discovery led to Koyo increasing its production of radios to 10,000 units per month and record players to 500 units per month. By joining forces with U.S. consumer electronics maker Philco as its OEM (original equipment manufacturer) supplier in 1962, Koyo’s most popular radio product sold more than 100 million units. Since then, Koyo, as well as the nation of Japan, has been a recognized leader in producing quality consumer electronic products as well as industrial components for worldwide distribution. In the early ‘60s, Koyo was once again exploring new markets with research into the fields of semiconductor function and proximity sensors. This enabled Koyo to add new products and moved the company in the direction of factory components, including the manufacturing of proximity switches, decatron counters, electronic counters, electronic timers, industrial TV cameras, and photoelectric sensors. Then in 1962, Koyo began producing a non-contact relay called the KOYO-O-MATIC series which became the predecessor to the PLC (programmable logic controller). These non-contact relays were not easy to work with and required individual hardware systems to be installed as well as the need to manage a difficult change of control content known as remodeling. By 1983, Koyo’s stature in the PLC manufacturing industry became recognized worldwide. The company’s SR21 PLC caught the attention of General Electric which decided to use Koyo as the OEM supplier for their own Series One offering. The product sold so well that GE nicknamed it “America’s Most Popular PLC.” It is estimated that more than one million of these units were installed worldwide. Over the years, more accolades poured in for Koyo’s PLC. 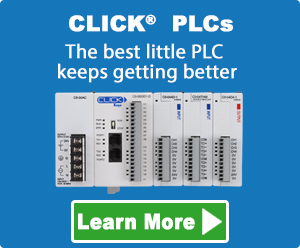 Texas Instruments also began to private label the Koyo product with enhancements and called it their “Best Value PLC.” Siemens Industrial Automation also decided to private label the PLC and, once again, the product line with additional enhancements was named a “Best Value PLC” by Siemens. To date, more than three million modules of the SR21 by Koyo Electronics have been sold, making it one of the most widely marketed PLCs in history proving that it is extremely reliable and well-suited for many applications. For the first few years, PLCDirect by Koyo sold products primarily with a printed catalog and toll-free phone number. The first catalog featured about 200 products. Just before the turn of the new millennium, the company changed its name to AutomationDirect.com and launched its e-commerce site.